One of my favorite things in the world is Yellow Jasmine Rice. 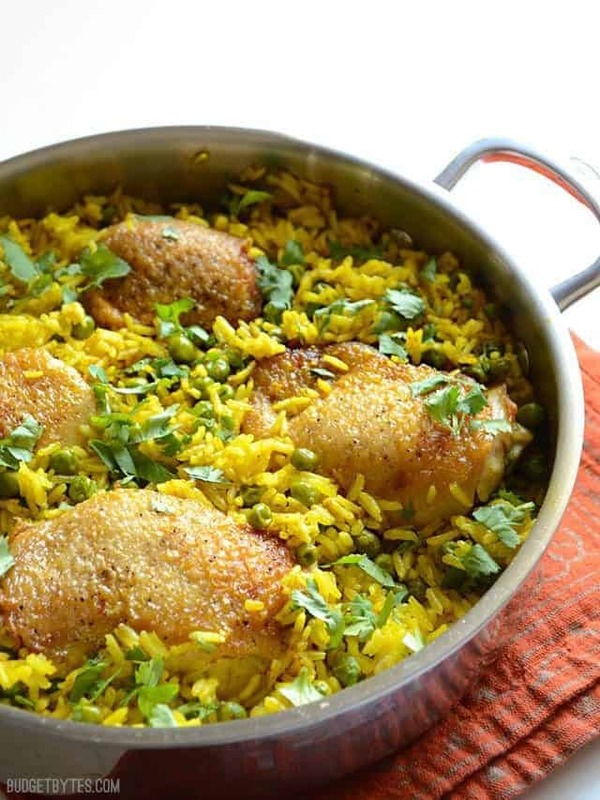 It’s so flavorful and fragrant that I could eat an entire bowl by itself, but that wouldn’t exactly be a complete meal. :P So, I decided to add a couple extra ingredients to round it out and make it a complete meal. 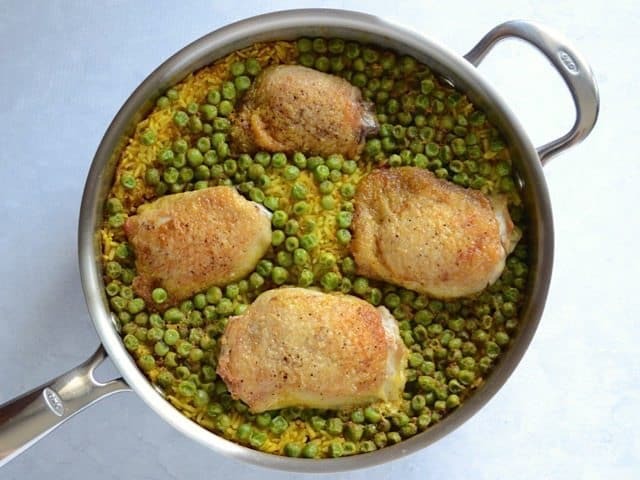 I found some chicken thighs in my freezer (leftover from Lemon Pepper Chicken with Orzo) and I added some peas for extra color, flavor, and texture (another “back of the freezer” find). 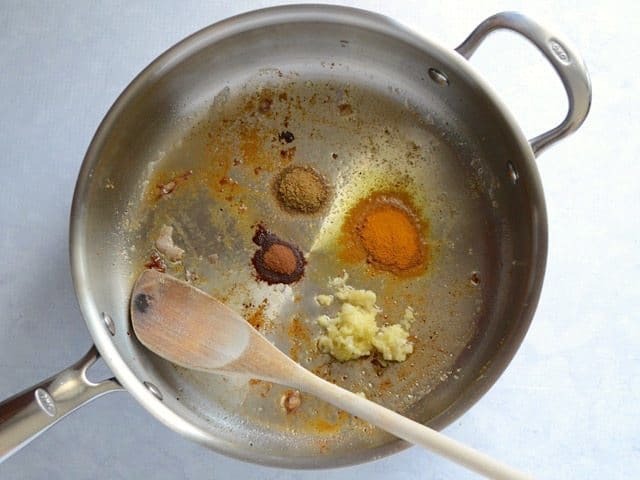 Everything cooks in the same skillet for more flavor and less cleanup. I love it when you can cook the main dish (chicken) and the two sides (rice and peas) all in one vessel. 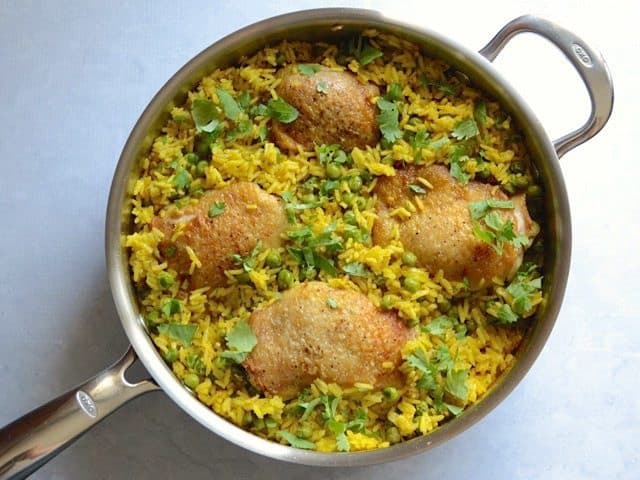 Hello, Yellow Rice Chicken Skillet! I like simple. Very, very simple. Pat the chicken thighs dry with a paper towel, then season both sides with salt and pepper. Heat a large deep skillet over medium heat. Add the oil, then tilt the skillet to spread the oil over the surface. 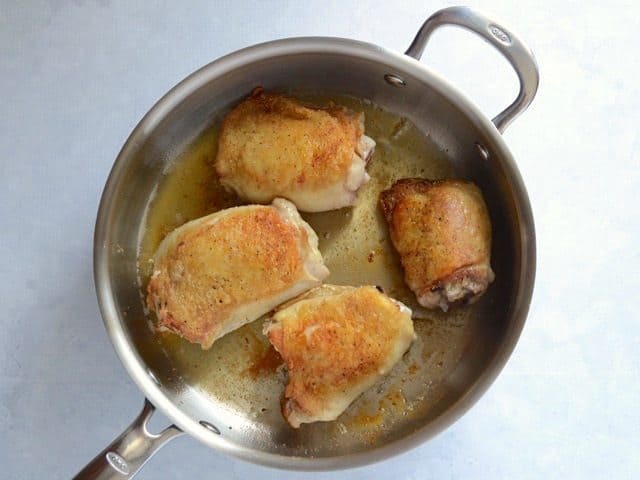 Place the chicken thighs in the skillet, skin side down, and allow to brown before flipping (about five minutes). Flip the thighs and let brown on the second side (another five minutes). 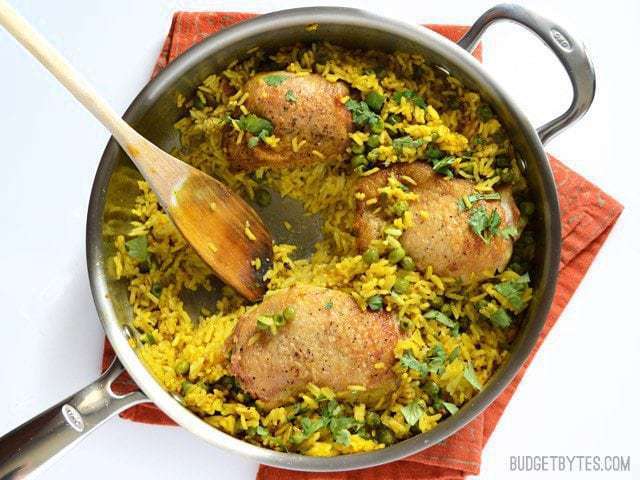 Remove the browned thighs to a clean plate. If there is excess oil in the skillet, pour it off into a bowl to cool, leaving about 1 tablespoon of oil and fat in the skillet. Add the minced garlic, turmeric, cumin, and cinnamon to the skillet. Sauté for about one minute, or until the garlic is soft and fragrant. 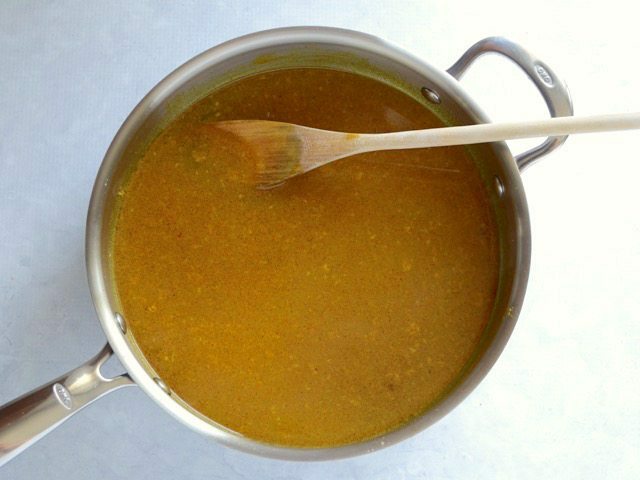 Pour the chicken broth into the skillet and use a wooden spoon to dissolve any browned bits off the bottom of the skillet. Once the browned bits are dissolved, add the frozen peas and rice, and give it a quick stir to distribute the broth and spices. 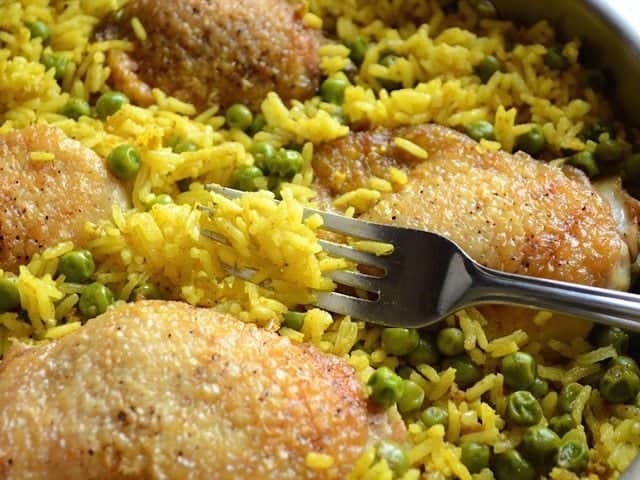 Nestle the browned chicken thighs into the rice and peas. Place a lid on the skillet and turn the heat up to medium-high. allow it to come to a boil. Once it reaches a boil, turn the heat down to low (or just above low) and let the skillet simmer for 25 minutes. After 25 minutes, turn the heat off and let it sit undisturbed for an additional 10 minutes. 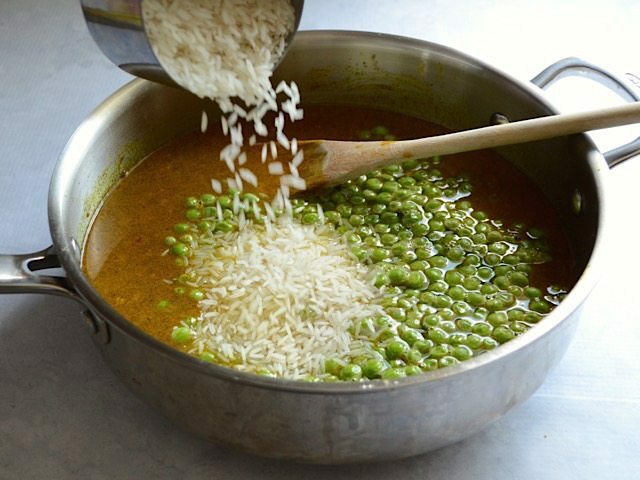 Finally, remove the lid and fluff the rice with a fork, mixing the peas in as you go. Top with fresh cilantro, if desired. *I use Better Than Bouillon brand soup base for my broth. It's less expensive, has an extended shelf life in the refrigerator, and you can mix up any quantity you need. Start with four bone-in chicken thighs, with skin. Pat them dry with a paper towel, then season both sides with salt and pepper. Drying the surface helps them brown better in the skillet. Heat a large deep skillet over medium flame. Once hot, add 1 Tbsp vegetable or canola oil. Tilt the skillet to spread the oil over the surface. 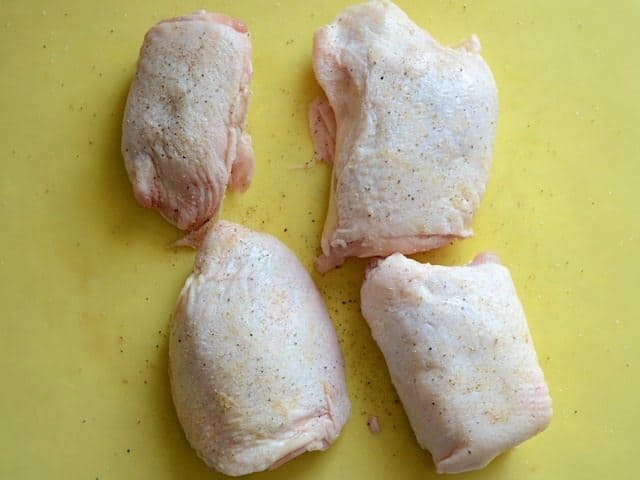 Add the chicken thighs, skin side down, and allow them to brown before moving them (they will actually kind of stick to the surface until they are brown, at which point they usually “release”). Flip the thighs and brown on the other side. Once both sides are browned, remove the chicken to a clean plate. If a lot of fat rendered off of the chicken thighs, pour some out until there is about a tablespoon or so left in the skillet. Add 2 cloves of minced garlic, 1 tsp turmeric, 1/2 tsp cumin, and 1/4 tsp cinnamon. Sauté the garlic and spices for about a minute, or just until the garlic is soft and fragrant (but has not browned). Deglaze the skillet with 2.5 cups of chicken broth. 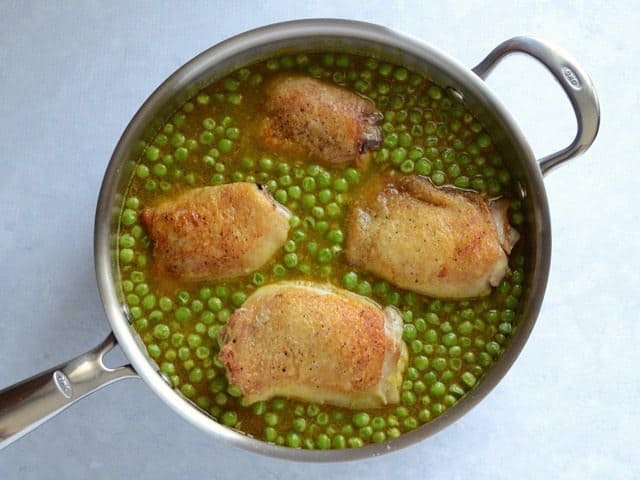 “Deglaze” just means to use the chicken broth to dissolve any browned bits (called fond) off the bottom of the skillet. The browned stuff is the good stuff. Finally, add 1.5 cups of frozen peas and 1.5 cups long grain jasmine rice. 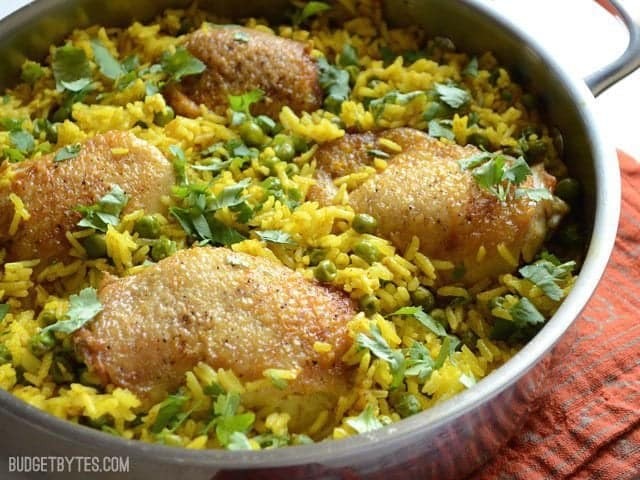 Give the skillet a quick stir to distribute the spices among the peas and rice. 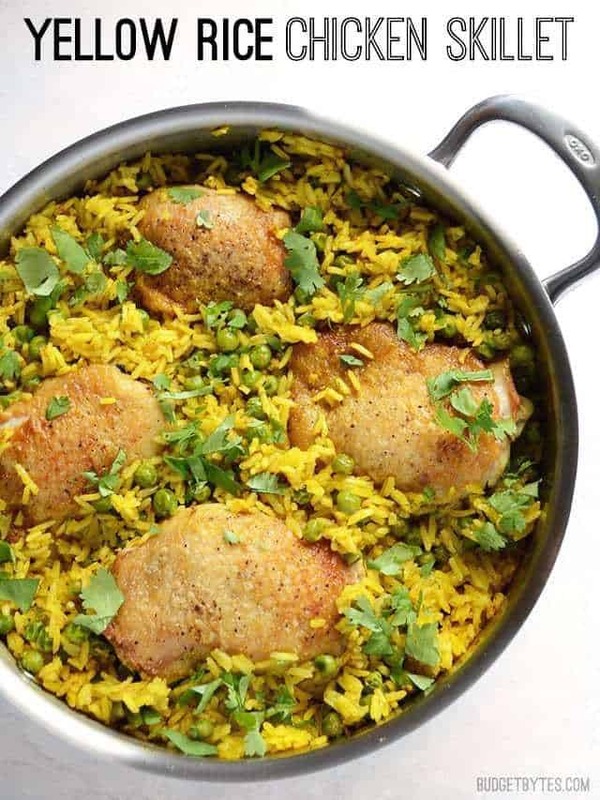 Return the browned chicken to the skillet, nestling it into the rice and peas. Place a lid on the skillet and turn the heat up to medium high. Allow it to come to a boil. Once it boils, reduce the heat to low (or just above low – so that it doesn’t stop simmering) and let the skillet simmer for 25 minutes. After 25 minutes, turn the heat off and let it sit undisturbed, with the lid on, for ten more minutes. The photo above is what it looks like after simmering and resting. Use a fork to fluff the rice and stir it up a bit. All the peas and many of the spices float to the top while it simmers, so use the fluff time as a way to make sure everything is evenly mixed. Top with fresh cilantro, if desired. YUM! 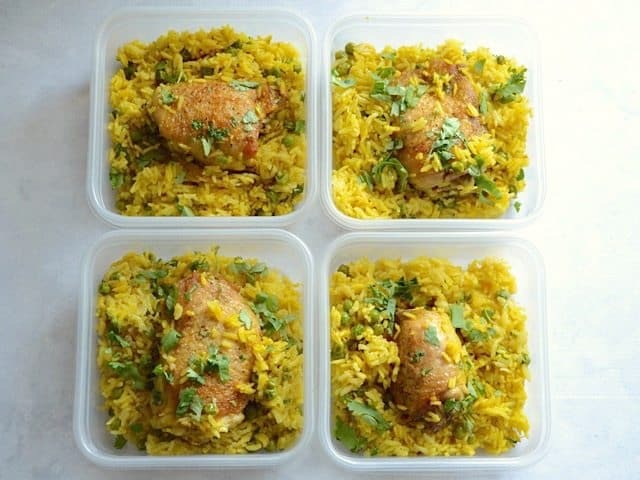 Of course, I divided my Yellow Rice Chicken Skillet up into individual containers so I could just grab one at a time and microwave it to reheat. These also freeze decently well. 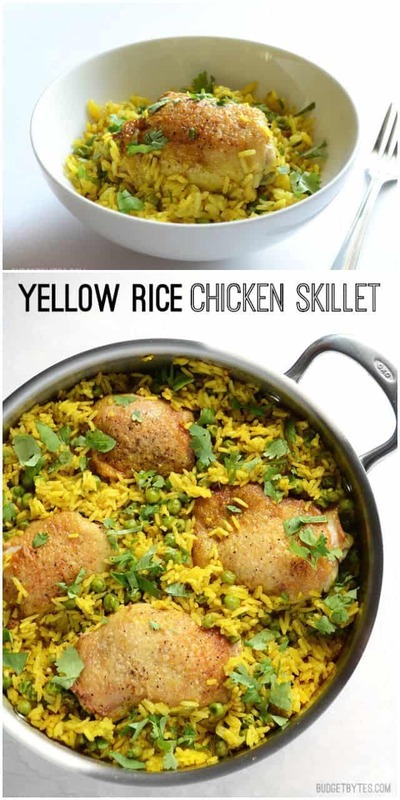 Really delicious and easy! 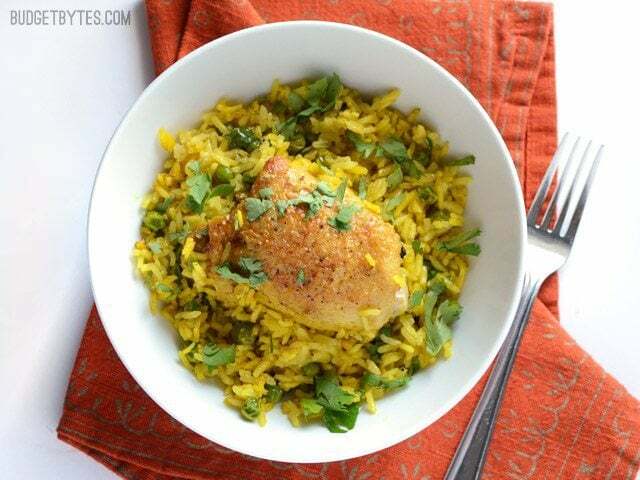 I was pleasantly surprised how those three seasonings made the rice so good! 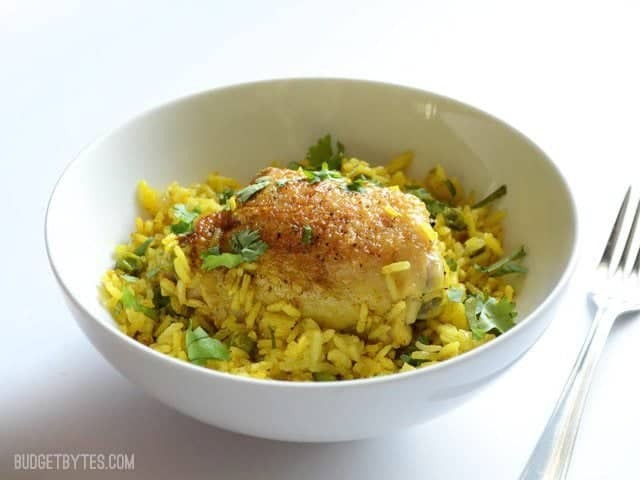 I used boneless skinless chicken thighs instead, but still really good! Yeah – wow. A dash of berbere would give this a bit of north african zing. next time, to see if perfection can be dialed up to 11. Tried this last night and it came out really well! For something so tasty it was very simple and easy to make. I made a few slight errors when cooking, such as using too much stock/oil so it came out a little darker and oilier than I would have liked. The other half devoured it however and is already asking for it again. The cilantro garnish on top was such a game changer too!!! I think I just found my new go to! Any thoughts on converting this recipe for then instant pot? I love this meal and would love over to make it even easier by preparing it in the IP. Thanks! I’m trying this tomorrow but with legs :) Because that’s what was in the back of the freezer! I’ll probably add the peas but do some steamed broccoli on the side too because it needs using up. I am without a stovetop or oven for the foreseeable future so these one pot wonders are really helpful for me! Really tasty and easy to make. A staple in my kitchen for sure! This was so good and easy to make. I didn’t have chicken broth so I used water and bouillon cubes I had, I used basmati rice, used chicken breast, left out the peas and cilantro (just because I didn’t have any) and it was sooooooooo good. The 4 year old loved it too!!!! !